In this July 27, 2018 photo, the Dave Johnson coal-fired power plant is silhouetted against the morning sun in Glenrock, Wyo. The Environmental Protection Agency is proposing to roll back another coal regulation, this one for new coal plants. Scientists are speaking out about what they say have been “remarkable improvements” in curbing mercury emissions under Obama-era regulations that are now threatened by the Trump administration. Mercury is a toxic chemical most commonly associated with coal-burning power plants. 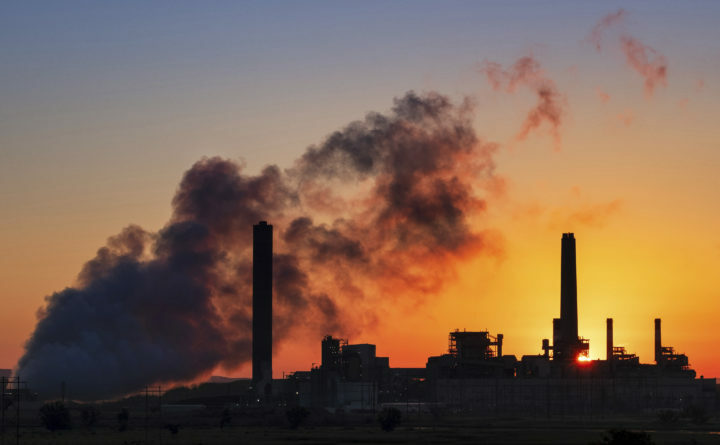 Because they are downwind from coal-burning states, Maine and the rest of New England have traditionally had higher than average rates of mercury contamination, and scientists say a proposal to weaken emission rules could impede progress. The coal industry considers the 2011 Mercury and Air Toxics Standards, known as MATS, the most expensive air pollution regulation ever implemented and responsible for the closure of dozens of coal plants around the country. Acting Environmental Protection Agency administrator Andrew Wheeler is a former coal lobbyist, and now the EPA is proposing to weaken MATS by heavily weighing costs to the industry. The EPA maintains that the Obama administration was indifferent toward that side of the equation. But scientists say the agency is downplaying the health and environmental benefits of the rule across the country. “The reductions in emissions of mercury in the U.S. since 2006 have decreased about 85 percent,” said Charlie Driscoll, a professor at Syracuse University who spoke to reporters in a teleconference Monday. Most of the emissions Driscoll’s referring to came from coal-fired power plants, and he said much of the reason for their reduction can be attributed to the MATS rules. “We’ve seen decreases in mercury in air, in atmospheric deposition, in water, in soil, and we’ve seen declines in both freshwater fisheries in the U.S. in mercury as well as marine fisheries in the Atlantic Ocean,” he said. Mercury is a neurotoxin that is especially harmful to children and developing fetuses, which is why the Maine Bureau of Health has a freshwater fish consumption advisory for pregnant women, nursing mothers and kids under 8. Because of the health benefits of eating seafood, Dr. Philippe Grandjean of the Harvard School of Public Health said he does not want people to give it up entirely. Currently, he said certain larger fish such as shark, swordfish and king mackerel should not be consumed because they contain higher levels of mercury, which becomes more concentrated as it moves up the food chain. Grandjean said he does not want to see that advisory extended to other types of seafood. “We want to make sure that mercury is not diminishing our chances of providing healthy food to pregnant women and to Americans in general, so this is why we’re having this meeting today,” he said. The Obama administration previously estimated that the potential health benefits of reducing mercury exposure were worth $6 million per year, and the cost to improve technology on the industry side about $9 billion. But Dr. Elsie Sunderland of the Harvard School of Public Health said the benefits of reducing mercury were only calculated for a single category of individuals: the children of freshwater anglers. “That’s a tiny subset of the potential benefits of reducing mercury exposures in the population,” she said. Instead, Sunderland said the direct benefits of reducing mercury are also in the billions of dollars. And as far as industry is concerned, she said most of the cost of cleaner technology has already been passed onto consumers. In July, the nation’s largest utility trade association urged the EPA to leave the mercury rule in place because it said the industry had already installed the required pollution controls.